Your life happens on your devices. Whether it’s keeping up to date, sharing a photograph, or getting work done, it happens here. Why not print from here too? Welcome to mobile printing. It happens here. You can access our mobile printing service anywhere you have internet access, from your desktop, laptop, tablet, or even your phone. Just visit print.jcpl.org to get started. 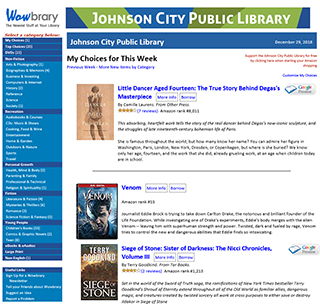 Once you’re at print.jcpl.org you can log into your account. Enter your library card number as your username and your last name as your password. 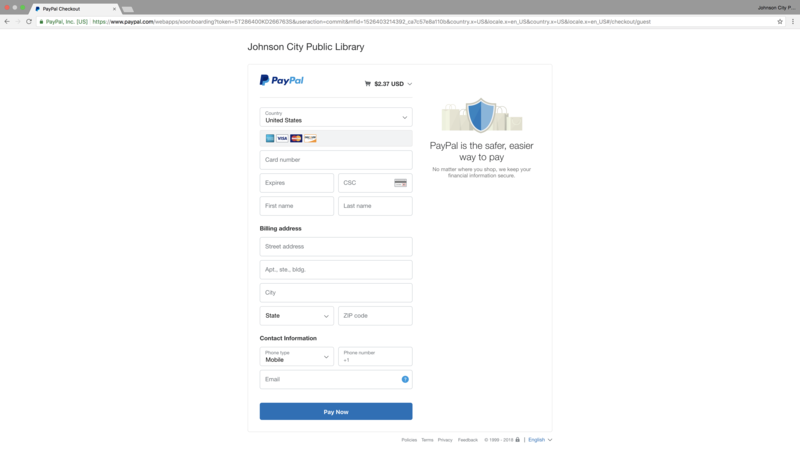 If you do not have a JCPL library card but you live in the area, visit get a library card for more information on how to register, including information on the two forms of identification you will need to bring. If you only need to print, you can create a guest account. Tap/click “I am a guest” to register a guest account. Remember that this is a separate account from any other printing accounts you have, and any money you credit to this account can only be used with this account. To log in with a guest account again, you’ll need to log in with the same email address you used to create the guest account. Tap/click the “Upload” button near the top left side of the screen. 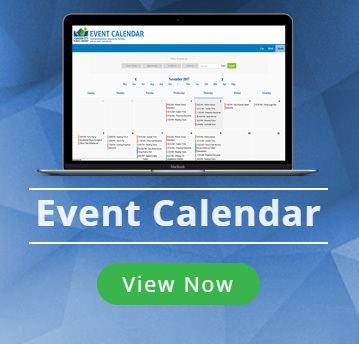 Here you can upload any document, spreadsheet, powerpoint, PDF, or image you want to print. Going forward, we’ll use the word “file” to describe any of these items you upload to print. Remember that once you upload a file to print, you cannot edit it. Uploads are limited to 25 MB or less per file. If you’re printing from a phone or tablet, you’re limited to either printing something from a photo you’ve taken or using a file organizer on your phone, like Google Drive, Dropbox, or Files (on Apple devices with iOs 11 or later). You’ve uploaded what you want to print? Great! Let’s look at your printing options. On the bottom right side of the page you’ll see your printing options, where you can change whether you want color or black and white printing, single or double-sided printing, what page range you want printed, how many pages of your file you want printed on a single page, and how many copies you want. 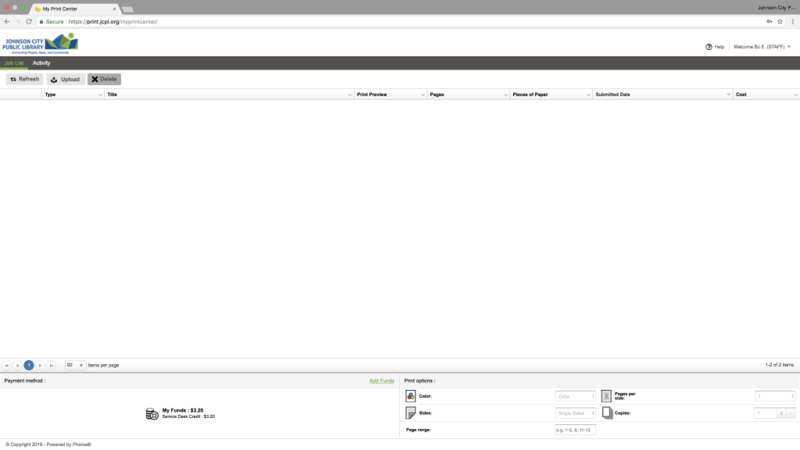 To make any changes to a particular file, select the box for your file on the left side of the screen. Then, after you choose your print options, your file will update instantly. 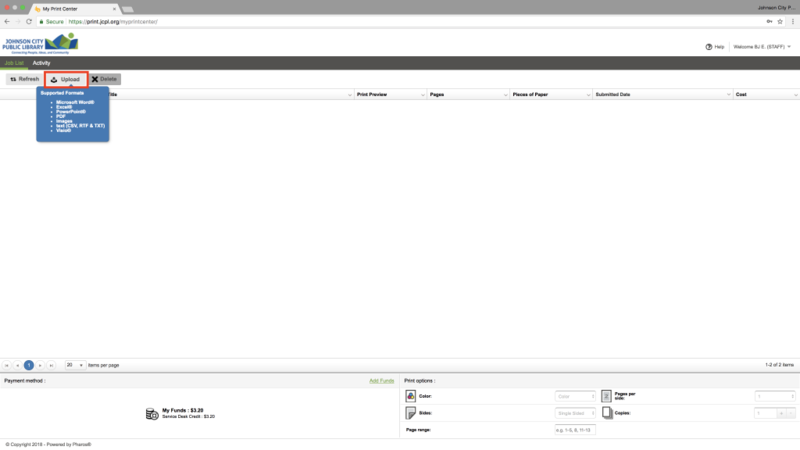 The cost for the print job will also update instantly, which you can see on the right side of the screen. To make sure your file looks the way you want, you can preview it by tapping/clicking the icon in the middle of the page with a magnifying glass. Once you’ve uploaded a file, it will be stored in the cloud for 48 hours. If you do not come to the library and print your file within 48 hours of uploading your file, it will be deleted, and you will have to upload your file again before you can print. 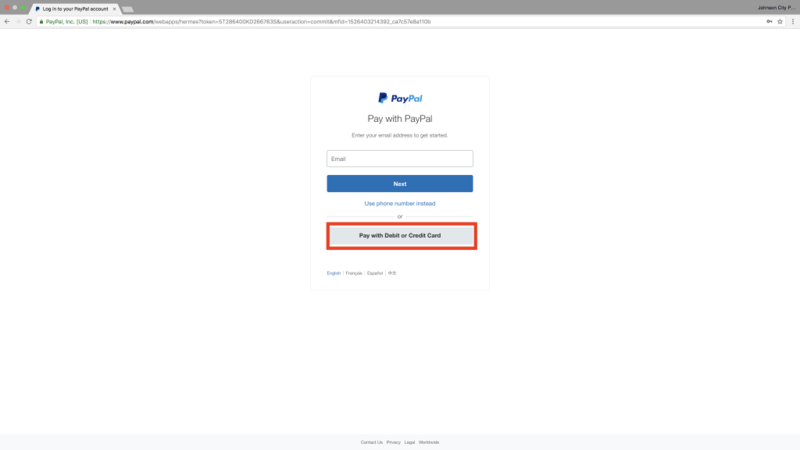 You’re now at Paypal, where you can log into your Paypal account to credit your account. Just below the Paypal log in, you can choose to pay with a debit or credit card instead. You can also pay with cash at the print station at the library. 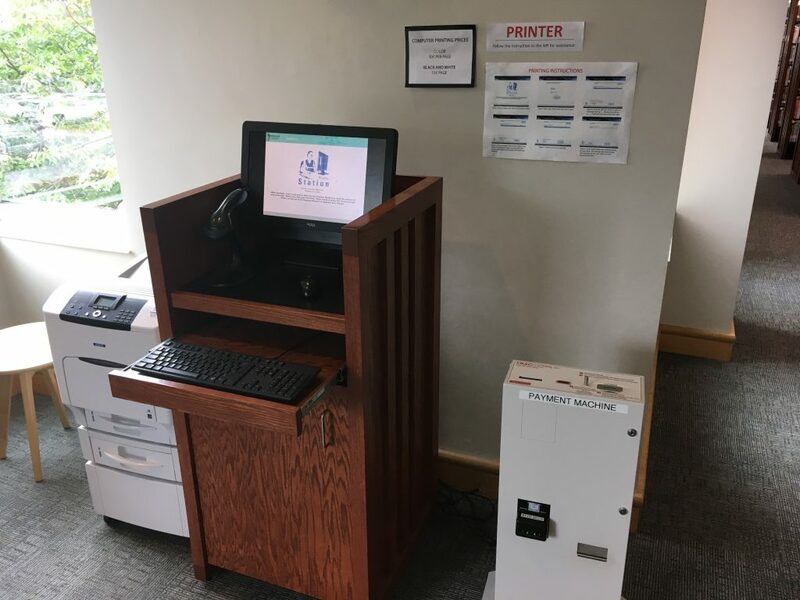 Once you’ve selected the file you want printed and chosen the print preferences you need for this project (including color and page options), visit one of our print stations here in the library. 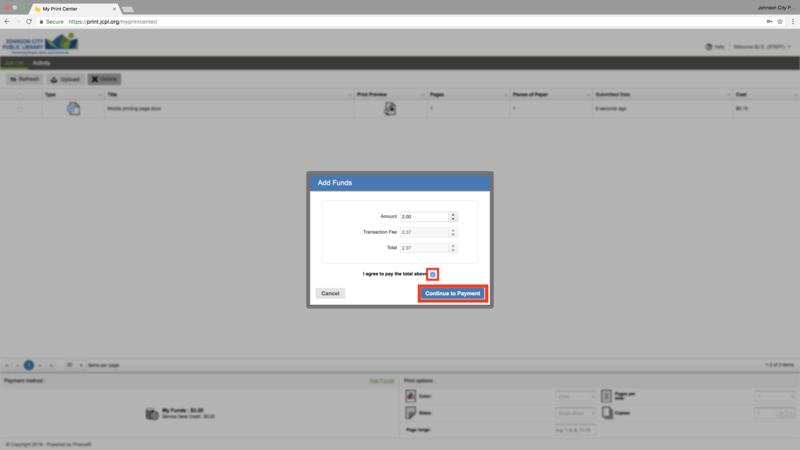 You’ll need to log in to your account at the print station, select your file, and then click “print” at the bottom of the screen. Your account will be automatically deducted for the printing fees. If you’re paying cash, you’ll need to insert the full amount into the cash payment kiosk before you press “print.” We charge 0.15 for each black and white page, and 0.50 for each color page. Pick up your print job at the printer nearby and you’re done! Having trouble? Ask us for help at the information desk (second floor) or the youth services desk (first floor), or if you’re on the go call 423-434-4454. We’re more than happy to help!